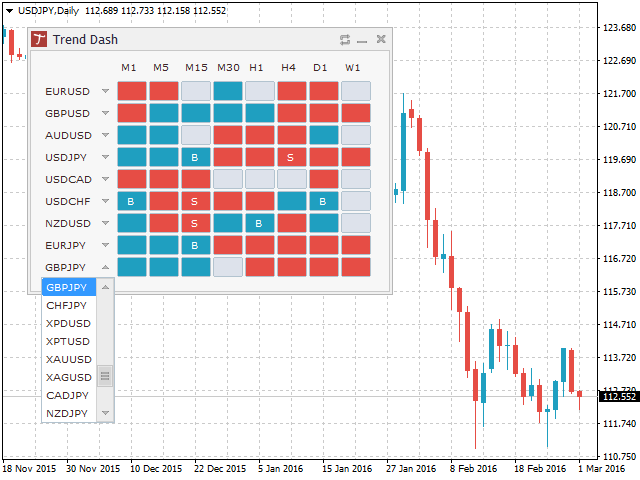 Tipu Trend Dashboard is based on the Tipu Trend indicator. Please contact me here at MQL5 if you would like to use this panel for your custom signals. 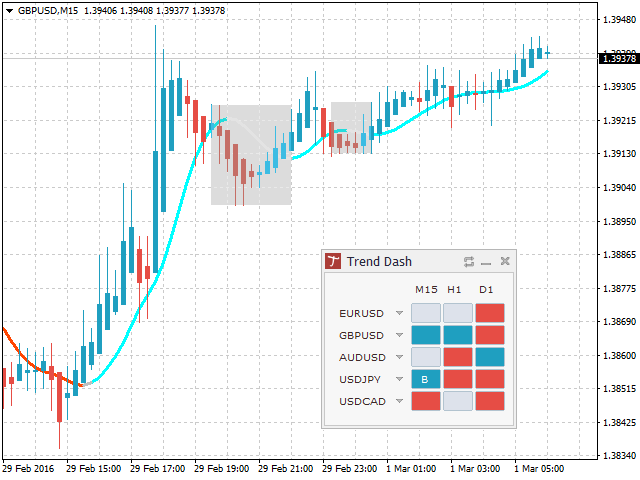 Tipu Trend Dashboard plots trend + signal of the major currency pairs and the selected time-frames. If you are constantly missing opportunities and having trouble in constantly changing charts to find the opportunities, this indicator is just for you. 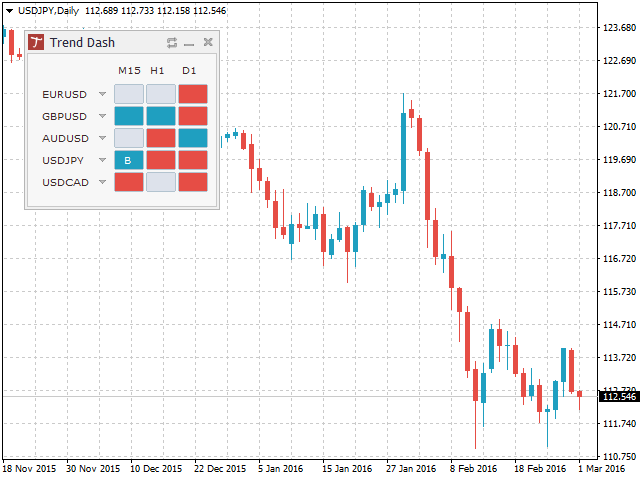 Tipu Trend Dashboard uses the visual panel created for the Tipu Panel indicator and gives signals based on the Tipu Trend indicator, for the multiple currencies and the multiple time frames. Enable your choice of alerts and never miss an opportunity again! An easy to use Panel that shows the trend + signal of the selected time frames. Customizable Panel. The panel can be moved to any place on the chart or minimized to allow more space. Customizable Buy/Sell alerts, push alerts, email alerts, or visual on-screen alerts. Tipu Trend Dashboard uses an easy to trade indicator that smooths the noise in the price action, and highlights the ranging markets. 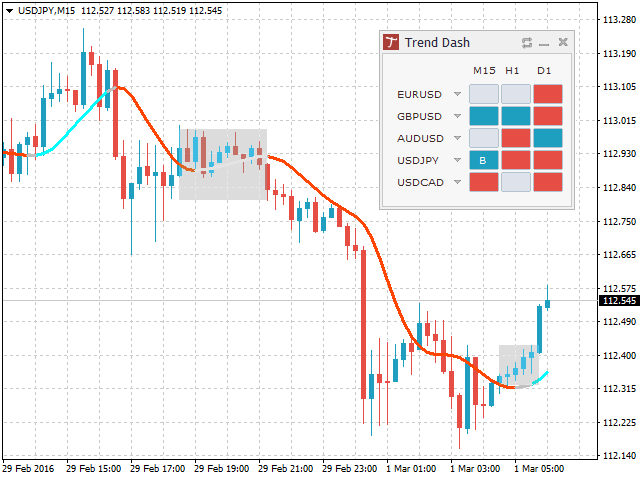 Tipu Trend Dashboard is very simple and easy to use, just drag the indicator to the chart and wait for your signal before you trade. ... 5 Mins ? : show 5 min trend + signals on the panel, select true/false. ... 15 mins ? : show 15 min trend + signals on the panel, select true/false. ... 1 hour ? : show 1 hour trend + signals on the panel, select true/false. ... 4 hour ? : show 4 hour trend + signals on the panel, select true/false. ... 1 day ? : show 1 day trend + signals on the panel, select true/false. ... 1 week ? : show 1 week trend + signals on the panel, select true/false. Uptrend Color: settings for the uptrend color on the panel. Buy Signal Color: buy signal color on the panel. Downtrend Color: settings for downtrend color on the panel. Sell Signal Color: sell signal color on the panel. Alert Shift: candle delay for the signal, enter 1 if you want the alert sent after 1 candle to be passed. Alert Mobile: select true/false to get push notification on your device, make sure the device settings are correct here. Alert onscreen on change: select true/false to get alert on the terminal, this alert shows in a separate window. Alert email on change: select true/false to get email alerts, make sure the email settings are correct here. Outstanding dashboard, and it's free! Useful information, all in one place. I find your jobs, simply fantastic!!!!!! I support you with big satisfaction. Well done. Another good product by Kaleem 5 stars, really well done. Kaleem is also very kind and responsive to consider suggestions useful to improve his indicator. To follow !!!! Very nice, works like a charm, five stars! Fixed problem with loading last active symbols on dashboard on terminal reopen. Fixed disappearing panel on window resize. Fixed conflict with trade levels. The panel was moving trade levels when it was overlapped with trade levels. Fixed error in updating the total column. Added "Total" column for combined alerts when the selected TF align. Added more customization options for the panel. New drop-down menu for the symbols, now you can customize your own watch list. Expand panel to support up to 9 symbols. Added all time frames (except Month). New Feature Added: switch symbol+period by simply clicking the trend boxes in the panel.